Located within minutes of downtown Houston, Buffalo Bayou Park is a 160-acre, 2.3-mile long public space that has been subjected to years of neglect. Surrounded on both sides by high-use thoroughfares, the park was also difficult for nearby neighborhoods to access. 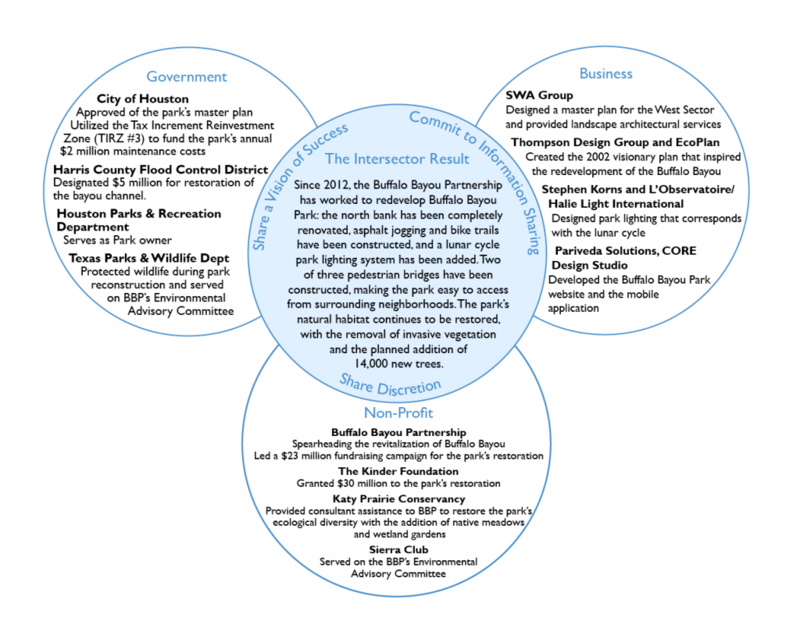 In 2010, the Buffalo Bayou Partnership (BBP) received a $30 million grant from the Kinder Foundation, which served as a fundraising catalyst for the park’s revitalization. In 2012, under the leadership of the BBP Board and President Anne Olson, collaborative partners including the City of Houston, the Harris County Flood Control District (HCFCD), and a variety of non-profit organizations, design firms, and community groups began reconstruction of the park. With the foundation grant, as well as an additional $23 million from private donations and $5 million donated from the HCFCD, the BBP has been transforming the park by upgrading walking and biking trails, adding pedestrian bridges to adjacent neighborhoods, and restoring the natural landscape and bayou channel. Completion of the transformation of Buffalo Bayou Park is slated for June of 2015, a redevelopment which will make the park easy to access for neighboring communities and complement the cityscape of Houston with the nature of the bayou. Anne has been president of the Buffalo Bayou Partnership since 1995. Along with the BBP board and staff, which includes Buffalo Bayou Park Project Manager Guy Hagstette and Director of PR and Events Trudi Smith, Anne has orchestrated the enhancement of the bayou channel and the surrounding green space by working with a diverse group of government leaders, design specialists, and community and environmental advocates. Anne has helped attract over $150 million in contributions to BBP initiatives with nearly $58 million – including the Kinder Foundation gift – raised specifically for the Buffalo Bayou Park’s restoration. Under her leadership, the BBP has received numerous national, state, and local planning and urban design awards, such as the 2009 American Society of Landscape Architects Award of Excellence. For nearly twenty years, Anne, the BBP board, and staff have directed a series of initiatives that have enhanced the bayou’s amenities while at the same time preserving and cultivating its ecosystem. Anne first learned about the potential to redevelop the bayou while serving as Executive Director of the Greater East End Chamber of Commerce. She recognized that the bayou had not been restored in the part of town she represented; thus, the Chamber and the BBP jointly developed and published a master plan to revitalize the East Sector of the bayou. During this time, Anne became the President of BBP. Originally from upstate New York, Anne moved to Texas to work as Director of Public Relations for the Houston Public Library. During her five-year tenure in Houston’s East End Chamber of Commerce, she became familiar with the various neighborhoods and communities around the bayou. As BBP President, Anne has kept in contact with these community leaders, some of whom are now elected city council members. Throughout her time with the BBP, Anne has built longstanding relationships and communicated future park objectives with government officials, non-profit leaders, private donors, and city residents: “It’s reaching out to as many people as you can.” She has demonstrated her capacity to leverage these networks in order to advance the BBP’s initiatives. 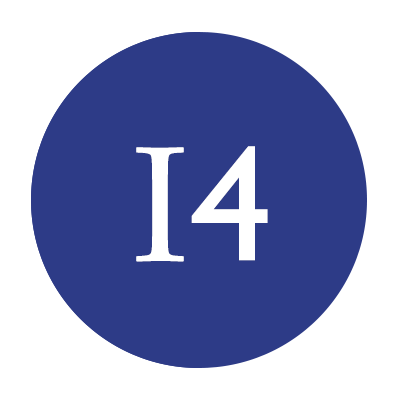 For example, Anne had previously worked with urban planner Guy Hagstette, when he served as Director of Planning and Capital Projects for the Downtown Management District and Director of Urban Design under then-Mayor of Houston Bill White. Anne recognized Guy’s breadth of experience as an urban planner and architect and, in 2012, hired him to serve as Consultant and Buffalo Bayou Park Project Manager. With the help of individuals like Guy, Anne has been able to broaden and strengthen support between the BBP and community leaders in Houston. Anne’s project management and public relations skills have been essential for the massive and multi-partied undertaking of outreach required as BBP President. In managing the various public work projects of the BBP, Anne has made sure that each key stakeholder across different sectors is represented in the decision-making process. Anne cites a diverse board, with members that include government, foundation leaders, environmental conservationists, neighborhood representatives, and real estate developers. Anne’s fundraising and networking skills also have been essential in her position. Anne has built trust and fostered cross-sector understanding of the park’s revitalization by establishing stakeholder groups with a diverse set of members. There was a concerted effort from the BBP to hold numerous community meetings before the initial stage of the park’s revitalization in order “to get everyone’s input.” The BBP Board of Directors exemplifies this diversity of perspectives: there are representatives of major foundations, community leaders, conservationists, and high-level real estate developers – each with term limits that keeps the organization fresh. Another example is Buffalo Bayou Park’s environmental advisory committee, which has representatives from the Texas Parks & Wildlife Department, the Katy Prairie Conservancy, the U.S. Fish & Wildlife Service, and the Sierra Club. In 2006, the BBP had successfully completed its renovation of the Sabine-to-Bagby Promenade, which is along the bayou but closer to downtown. At the same time, the Kinder Foundation had spearheaded the development of Discovery Green, a public park adjacent to the downtown convention center. The BBP’s well-received reception of the transformed promenade excited philanthropists Rich and Nancy Kinder, and a connection was born. After two years of preparatory meetings, in 2010 the Kinder Foundation offered an unprecedented $30 million grant to the BBP in order to revitalize Buffalo Bayou Park. This large catalyst gift stimulated private and public funding for the remaining $28 million required for the park’s redevelopment. The BBP’s Campaign Committee was able to initiate connections with major foundations, corporate funders and private sponsors for sizable financial contributions, and direct mail campaigns to Houston residents simultaneously raised awareness and essential capital. Anne cites that the fundraising campaign is now in a “very public stage.” Through direct mail, the BBP has raised almost $400,000. People can pay $125 for their name on a plaque or $5000 for the designation of a park bench. The revitalization of Buffalo Bayou Park required extensive community outreach and teamwork among various parties in order to ensure the public space equally met each group’s needs. For example, the BBP arranged meetings to hear feedback from and address the concerns of the jogging community, the bike community, and several different civic groups. After meeting with design specialists to discuss ideas for the park’s redevelopment, BBP representatives went back to meet with community groups to hear their points of view. Furthermore, once the park construction had begun, the BBP invited community members on walking tours to better understand the revitalization process every step of the way. Along with the BBP’s concerted efforts in community outreach and discussion, the organization has ensured open communication about the park’s redevelopment through the use of up-to-date and interactive web-based information. BBP hired the design and communications firm, CORE Design Studio, to develop a special microsite on the BBP’s website devoted entirely on keeping the public informed. This site also featured a forum for Houstonians to express their thoughts and concerns about the park’s transformation. BBP consulted with the software firm Pariveda Solutions, which generated the Buffalo Bayou Guide’s mobile application, displaying a user-friendly map of park trails, updates about construction, and in-depth information about park and other Buffalo Bayou features. The app offers details about park recreation activities, public art installations, and locations of famous gravesites in Glenwood Cemetery. The BBP’s Organizational and Strategic Plan Committee monitors the organization’s five-year plan to ensure goals are met on a timely basis. The Harris County Flood Control District (HCFCD) initiated its own plan for the bayou channel’s restoration in order to control erosion and reinforce bank stability. The two parties have worked in tandem. The park’s redevelopment projects were built from the ground up: the HCFCD has worked on channel realignment and created flood benches for the bayou, while the BBP has coordinated the construction of footpaths, pedestrian bridges, and amenities such as a Nature Playground, an area for kids to enjoy the park’s natural environment. A playground is under construction that will be finished in the fall of 2015. A dog park near Studemont Street and Allen Parkway is set for completion in December of 2015. The dog park will include pavilions and two ponds for pets to cool off on a hot summer day. The multi-purpose private event space, The Dunlavy, is planned for development overlooking the bayou and Lost Lake. The venue will offer different cuisines of Houston restaurants run by Clark Cooper Concepts. HCFCD has completed its restoration of the bayou channel and banks by removing silt and re-grading the bayou’s slopes. With a gentler gradation on both sides of the channel, the bayou can serve as launch areas for canoes and kayaks. Katy Prairie Conservancy is reintroducing native landscapes that will restore ecological diversity in the park while helping to control erosion. Fifty percent of the park’s lawn will be replaced with meadows of wild flowers and native grasses. Stephen Korns and L’Observatoire/Halie Light International have designed the park’s innovative lighting treatments that correspond to the lunar calendar. As the moon wanes, the park’s accent lighting changes from blue to white; as the moon waxes, the colors change from white to blue.